On the whole, people don’t generally like to kill one another. Most wars throughout history are often more about the agendas of the state’s leaders than the soldiers on the field actually inherently feeling any real malice towards those they are asked to try to kill or otherwise defeat. Few events in history illustrate this as well as a remarkable episode that took place during WWI when, despite the orders of their commanding officers and leaders, the soldiers threw aside their weapons, got out of the trenches and had a make-shift Christmas party with those that just hours before they’d been trying to kill. This momentous event has become known as The Christmas Truce. If men must hate, it is perhaps just as well that they make no Christmas truce… The stench of the battle should rise above the churches where they preach good-will to men. A few carols, a little incense and some tinsel will heal no wounds… [A truce would be] so empty that it jeers at us. But a somewhat alarming (to the commanding officers and leaders of the nations) trend had already started occurring amongst the troops on both sides leading up to the truce. Stuck knee deep in their muddy trenches along lines so close together, the soldiers on both sides, who’d commonly thrown insults back and forth, started adopting a slightly more apathetic view of the war, more of a “live and let live” policy. In some cases, they even started tossing newspapers and other things back and forth, bartering for supplies like cigarettes, rations and the like, and holding conversations across the trenches. Perhaps it will surprise you to learn that the soldiers in both lines of trenches have become very ‘pally’ with each other. The trenches are only 60 yards apart at one place, and every morning about breakfast time one of the soldiers sticks a board in the air. As soon as this board goes up all firing ceases, and men from either side draw their water and rations. All through the breakfast hour, and so long as this board is up, silence reigns supreme, but whenever the board comes down, the first unlucky devil who shows even so much as a hand gets a bullet through it. …a most extraordinary thing happened… Some Germans came out and held up their hands and began to take in some of their wounded and so we ourselves immediately got out of our trenches and began bringing in our wounded also. The Germans then beckoned to us and a lot of us went over and talked to them and they helped us to bury our dead. This lasted the whole morning and I talked to several of them and I must say they seemed extraordinarily fine men… It seems too ironical for words. There, the night before we had been having a terrific battle and the morning after, there we were smoking their cigarettes and they smoking ours. These incidents of temporary peace along the line typically didn’t last very long and were never wide spread, happening in very small pockets. This changed on Christmas Eve of 1914 beginning along the trenches near Ypres, Belgium. It is reported that it started with the Germans setting up Christmas trees, singing carols, and lighting candles. The British and French then responded in kind, singing along, and soon the two sides in various places along the line were wishing each other happy holidays. Even more surprising between these two groups that were previously exchanging shots and explosives was that they now began exchanging Christmas gifts, handshakes, hugs, playing games, drinking, and generally having a good time with one another. There are even reports of prayer circles formed with members of both sides taking part. I wouldn’t have missed that unique and weird Christmas Day for anything. … I spotted a German officer, some sort of lieutenant I should think, and being a bit of a collector, I intimated to him that I had taken a fancy to some of his buttons. … I brought out my wire clippers and, with a few deft snips, removed a couple of his buttons and put them in my pocket. I then gave him two of mine in exchange. … The last I saw was one of my machine gunners, who was a bit of an amateur hairdresser in civil life, cutting the unnaturally long hair of a docile Boche (German), who was patiently kneeling on the ground whilst the automatic clippers crept up the back of his neck. Many soldiers wrote similar accounts in letters sent back home about the truce, but as this sort of behavior went against the massive propaganda campaigns going on at home, trying to stir the general populace up against the “enemy”, the governments on both sides suppressed these letters and kept them out of the media for a short time. This ended when the New York Times published a story on the event on December 31st. When the history of the war is written, one of the episodes which chroniclers will seize upon as one of its most surprising features will undoubtedly be the manner in which the foes celebrated Christmas. How they fraternized in each other’s trenches, played football, rode races, held sing-songs, and scrupulously adhered to their unofficial truce will certainly go down as one of the greatest surprises of a surprising war. The soldier’s heart rarely has any hatred in it. He goes out to fight because that is his job. What came before- the causes of the war and the why and wherefore- bother him little. He fights for his country and against his country’s enemies. Collectively, they are to be condemned and blown to pieces. Individually, he knows they’re not bad sorts… The soldier has other things to think about… Consequently, he has not time for rage, and blind furies only overwhelm him when the blood is up over fierce tussles in the heat of the thing. At other times, the childishness is apparent to him… But now an end to the truce. The news, bad and good, begins again. 1915 darkens over. Again we who watch have to mourn many of our finest men. The lull is finished. The absurdity and the tragedy renew themselves. While in most cases the Christmas truce only lasted from Christmas Eve through most of Christmas Day, there are reports that in a few segments of the line, it lasted as long as New Year’s day. 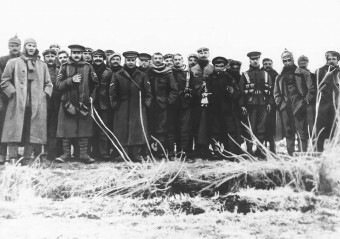 The Christmas Truce did not repeat the following year nor after as the fighting had become more intense and commanding officers were being more strict about fraternization. (They also went so far as to plan artillery barrages on Christmas day in many areas, to make sure the soldiers listened this time.) However, there are a few reports of very isolated, temporary truces that did happen the Christmas of 1915, but it wasn’t common like the one in 1914 and even the reported “truces” were little more than ceasefires, rather than actually having something of a party with the opposing soldiers. Even where there wasn’t a temporary ceasefire, there were reports that many of the soldiers ordered to keep the artillery going throughout Christmas purposefully fired over the opposing trench, such that nobody in the trench they were supposed to be aiming at would be hurt. Just as the Christmas truce was something of an impromptu event, so was the monument that stands to this day commemorating it. In December of 1999, nine people from Britain traveled to Ploegsteert Wood in Belgium, wearing uniforms they’d made in an attempt to mimic those worn by the soldiers in 1914. They dug trenches, setup sandbags and the like, and for a few days acted as if they were in WWI, eating rations and trying not to sink into the mud. After commemorating the Christmas Truce, they filled in the trenches and left a wooden cross where they’d done all this. They had not meant to setup any sort of official memorial and the wooden cross was supposed to be temporary, but people living nearby treated the cross so it would last in the weather, set it in a concrete base, and planted flowers around this sole monument to the time when, against all odds and orders, men from different warring nations stopped trying to kill one another and instead, for one day at least, became friends. It is estimated that around 15 million people died during WWI. All total, around 70 million soldiers fought in that horrific war. wow let the joy of Christmas spread world wide. merry Christmas to all of you. This is a fascinating and touching article. Thank you.